This is a concise yet complete overview of the problems of animal suffering, linking them to larger issues of human and environmental exploitation. Authors Erin E. Williams and Margo DeMello examine industries that exploit animals — meat processing companies and agribusinesses; medical experimentation and cosmetic testing facilities; the entertainment industry (circuses, rodeos, zoos, racing, and film making); the pet industry; the fur and leather industry; and commercial and recreational activities centered on hunting. The authors also consider the adverse environmental effects of animal exploitation from pollution to deforestation and the depletion of biodiversity. "…an excellent look at cruelty to animals on an institutional level in various industries, taking a 'common sense perspective' and revealing many disturbing facts .... This is a tough but fair-minded revelation of how mass production of animals for food and other purposes results in cruelty that usually remains hidden from sight." 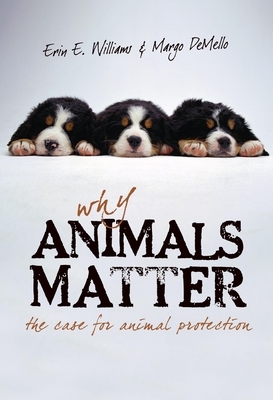 "Erin Williams and Margo DeMello have written a compact and compelling treatise on how animals suffer in institutional settings and why people of conscience should take note and take action. They have put together an overwhelming case for a new ethic in dealing with animals, and my greatest hope is that it will have a vast readership."